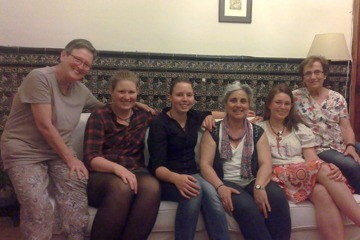 The Diocesean Centre in Oran and Bishop Jean-Paul Vesco are welcoming Souhir (Algeria), Rebecca, Silke and Antonia (from Germany) from end July for the month of August to live there as a temporary community. There will be a camp for children, time spent with young people from different backgrounds, including students from other African countries. The Community of Fratelli and Bishop Elie Haddad will welcome Friedemann, Florian and Jonathan (from Germany) in August in Sidon, Lebanon. They will engage in pastoral activities and work at the social and cultural centre of the Fratelli, in the town of Rmeileh with Syrians, Lebanese people and Palestinians, especially children. Viktoria (Ukraine), Miriam (Italy), Basia (Poland) and Anna-Larissa (Germany) will spend the month of August in Freiburg and Bulle, Switzerland. 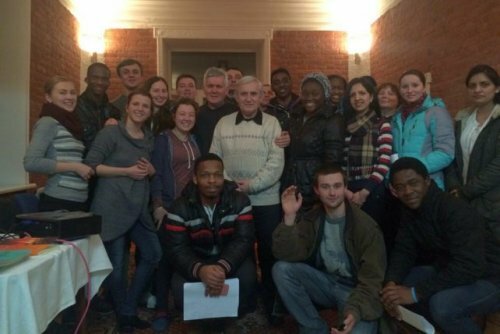 They Will be welcomed by the parish of St. Pierre and will be working with migrants, teaching and leading prayers. Contacts With various parishes and Christian communities are planned. 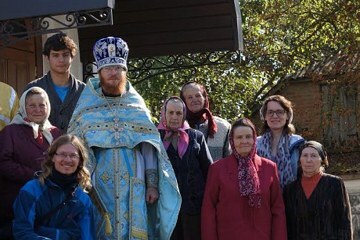 Clotilde (France) and Andy (United States) will be hosted from 20 July to 20 August by the parish of the Annunciation in Sumy, Ukraine. They will participate in various Caritas solidarity projects and will help lead times of prayer. Stanisław (from Poland), Felix and Nikolas (from Germany) and Hannes who is from the town itself, will be living in Bad Doberan (on the shore of the Baltic Sea), welcomed by the Lutheran parish. From 26 May to end June they will constitute a small temporary community, leading prayers in the Minster church and elsewhere, working in the community garden and with refugees. 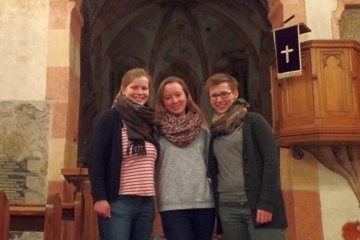 Paulina (Poland), Helena et Malena (Germany) will spend the month of June with the Lutheran community of Mustamäe (Tallinn / Estonia) and live there In a small provisional community. They will lead prayers and participate in activities ranging from serving meals to the animation of sharing groups. Visits to other church communities and individuals will also be on the program. 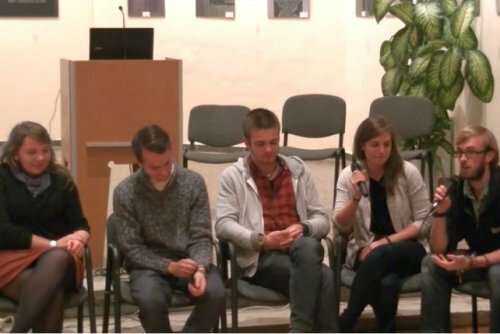 Two of the brothers and two young volunteers from Taizé were living in Givors, in the outer suburbs of Lyon, from early November until mid-December 2016. Their presence there was a small sign of fellowship with opportunities to discover signs of hope in the district, working closely together with the local churches, and with a particular focus on inter-religious dialogue. They were also involved in practical initiatives, social support work, and made pastoral visits as well as praying together three times a day. The prayers, open to all, were also an occasion to welcome a wider public. In August, Colin, Michael, Tomislav and Ben will live in a small provisional community in Paris with the Dominicans, working in a welcome centre for refugee children. This country is really different from everything we know but we are so happy to have the opportunity to discover it. People are very open and warm-hearted towards us. We get to know about the difficult situation in Ukraine as well. Many people are without work or even homeless. Twice a week we cook for them and this a new experience as well. We are impressed by the optimism of the people. War is a topic as well when people tell us about family members who have died. We met an old man who is blind. We visited him once to help him clean and he invited us again. He impressed us with his faith. For him believing is the source of life. We see an inner light he has. He is called Ishtwan. We had a prayer with many parishioners and many people from Africa. We also had the opportunity to meet some soldiers from Donetsk and that was a powerful experience as well. We met so many people; all of them were so nice to us. We got a lot of new impressions; some of them were quite hard, some were connected with so much joy. Sometimes I was worried about how things would work, but every time all was fine at the end, since we were led by God. The daily prayers helped us to quiet down and to handle it all. It was such a great time and in the end it was so hard to say goodbye to everyone. I could never have imagined I would enjoy it so much, meet so many interesting people and feel at home in Ukraine. Although we had a difficult goodbye, the time in Ukraine gave me a lot of new faith, strength and motivation for my life. Among the main activities that the girls did were a lot of charitable deeds, such as cooking and meal distribution for homeless people, visiting ill and elderly people, cleaning houses and, of course, we devoted one evening for a Taizé presentation. 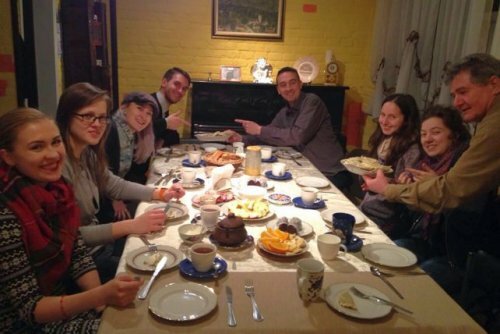 We all agreed that for Sumy it was an unforgettable experience of hosting volunteers, so we would like to invite more volunteers for Lent every year. It was important for us that the daily prayers were the center of our community. Besides Ewa and Peter there was another regular guest: Magda, a young woman from Słubice, who came every morning to the prayer. And although there were some problems with speaking English, she often stayed for tea or invited us to spend time with her and her husband. (…) It is a challenge to sing songs in Polish but we want to make it easier for the people to participate in the prayers. Our social activities were not spectacular. But for the people we met and whom we helped, they were important. For example we helped a women who is physically limited due to a disease, so we went with her to her parents’ grave and also did some shopping. Although she does not speak English or German and none of us Polish, the communication went very well; probably because she is a very open and curious person. I explained to the young women that the prayers they led were wings for me that helped me to face my challenges and daily problems. In the small village of Gyöngysoroszi we met a culture which is so exotic for us or by European standards. Yet we know they have shared the continent for many centuries with us. When we look at the gypsy population, they are nomads, so they are used to a totally different world and society than the one we live in. They value material things differently. In the primary school we visited we made the children laugh; we played together. I felt in a way that the adults were just as thirsty for our presence. They wanted to tell how hard it is to conduct their teaching mission. The teachers are all Hungarian and the students are all without exception Gypsies. The younger children seem unaffected by that segregation (all the Hungarian kids go to school in the nearby town) but the teenagers show signs of frustration and resentment. A grandmother told us how present this divide is in her life, even when, on Sundays, she goes to church. Yesterday, we had the great joy of being invited to lunch by Katti and her big family. To the simple pleasure of a good meal was added the satisfying feeling of having shown that such an invitation was possible. When, ten days ago, we expressed to the sisters our wish to share a meal with some of the adult villagers who were close to the community, they had answered that this was most probably not possible. The three of us were perfectly made to live in such a small community. It was not that we were all the same but the differences in experiences of life and faith, the three slightly different cultures of our countries and also the voices for the Taizé songs made it far richer than I had ever expected. It was not always without difficulties and sometimes we had some discussions about how or what to do but it was good for the three of us to know that there is a common base from which we could live together. 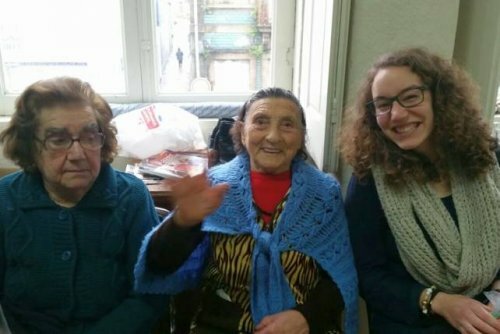 During Lent 2016, the Holy Year of Mercy, Xiaoxia (China), Johanna, (Germany), Franziska (Germany) and Dominika (Poland) are living in a small temporary community with the Canossian Sisters in Rome. With some brothers of the community, they are leading meditative prayers with the songs of Taizé twice a day in the church of San Giovanni Battista de’Fiorentini. At other times they are helping in a Caritas canteen, serving meals for refugees as well as for people who are homeless or unemployed. Crossing the street in Rome is a pilgrimage of trust! You have to be brave to take the first steps onto the street until you see the cars getting slower, so that you are sure you can continue your way safely. Coming to be a part of a small provisional community in the capital of Italy is a bit like that as well. There are many small uncertainties, for example that none of us speaks any Italian - only a few words or a bit of French and Spanish - and not many Italians speak good English - , but somehow we manage our way around the city. But when you hear the languages around, you know that you are not the only German, Polish or even Chinese in this very touristic city. Our days are structured by three prayers: morning prayer around 9am at home, midday prayer at 12 noon and afternoon prayer at 5pm with a few Taizé brothers in the side chapel of San Giovanni Battista dei Fiorentini. Between these two prayers in the afternoon, we actively practice solidarity and mercy by helping out in a Caritas canteen, which serves between 450 and 550 homeless, unemployed and refugees. It is beautiful to see that many people come to help. During our work, we automatically start singing, which is usually appreciated by the people eating. For many of them, the most important thing is that we give time and space in our lives to be with them. This experience shows us that going where we are needed, being there and seeing how to help without speaking the language requires trust at first but is not difficult. After all, we all smile in the same language! 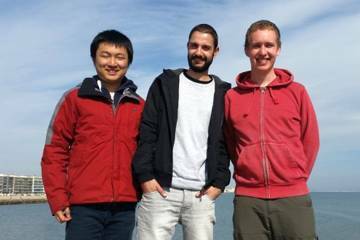 Petr and Tomasz, two volunteers from Taizé, are in Calais for a few weeks. 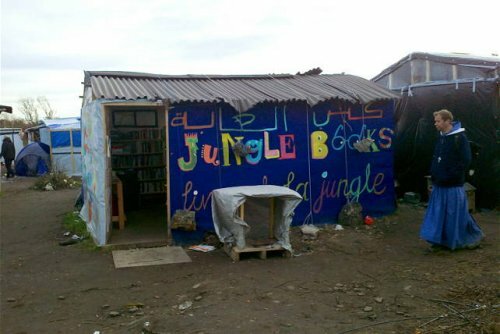 Here is their first message, giving some news from their life there and the work with the refugees in the “jungle”. We are sitting in “Maria Skobsova"s house after our second day in Calais. Marie and Adam took perfect care of us and we had a great time together. We are trying to organise a common prayer at home but mainly in the Jungle. 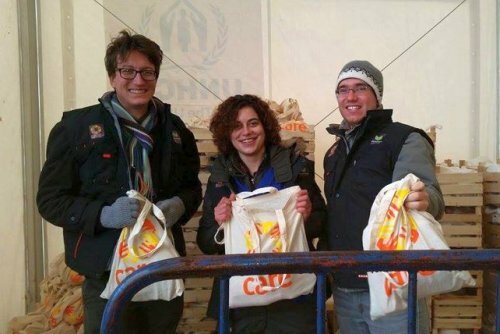 We helped in the so called "Belgium" kitchen to distribute 350 meals. Tuesday creates a great anxiety, because of the eviction ultimatum and destruction of half of the camp. 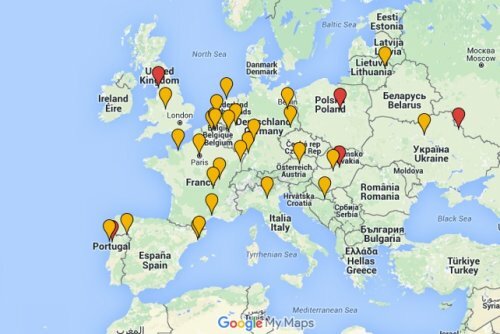 This is also where “our” orthodox church of Saint Michael Angel is. This ultimatum has been used few times in the past and although nothing happened, people are naturally scared. Please pray for this. Some time ago a few caravans belonging to the camp volunteers were attacked and some of them burnt. Fortunately nobody was sleeping in them at the time. For us the first impression is very strong. The worse was to see children in the camp.… and families with small babies… is this a sign of hope? And the parents are exhausted. We enjoy all the opportunities to stay and talk with people in the camp for many reasons. someone wants a small cross, another one needs some material; but mostly people want to simply talk about their day, about what will happen on Tuesday etc. In the Maria Skobtsev House, one of us is repairing the old house and even some bicycles. Yesterday we had a Taizé prayer. Together we were about 20 persons, mainly from Arras and Lille. We decorated our chapel and people from Arras played guitar. We’ve had a great discussion with Calesiens from an ecumenical association and the Anglican church. I understand more about the feelings and fears of people who are ’’tired by refugees’’. Even for these people it was very interesting to ask us for our opinions and daily experience of the camp. It’s necessary to be present also among the Calesians. We have try and understand them. They have to understand/feel that we aren’t here just for the refugees, but also for them. I feel same fears and prejudices of people in the Jungle and in Calasiens. The Maria Skobtsova House should be a place for making bridges between both groups. Eritreans - we are coming every day in the Jungle to pray in their Orthodox church. There is Salomon, who is a church leader. He is "easy-going and never-a-problem man". We used to sing as part of our prayer when we were alone. Once I joined a Mass there, which was very nice and at the end there was a six-year-old girl who sang and prayed for and with all the others. She reminded me of the children in Taizé and when I realized that she is also a target of hate against refugees I can’t keep from crying. Today the police started with the demolition of the camp. (…) Only shortly beforehand the Iranian Christians had asked me to sit in front of their houses together with them and to pray for them. (…) This is a sad day for the people in the camp, people who have run away from violence, from war and conflict, from poverty. They are people and youngsters who already suffer trauma. And please pray for the people who have lost their houses, for the people who have lost their papers and private stuff and for those who have been victims of violence once again. Why am I here? I can’t speak the language, no one understands when I speak English "because I speak too fast, and have a funny accent", I can’t sing, I have no idea what’s going on?! Why am I here? Then the words of a brother came back full steam - just be there, be with the people and have three daily prayers... that’s all you have to do. Okay. There is a strange intensity to interactions with people when you cannot speak the same language, that is not to say you do not understand each other. Without language, without the misunderstandings that sometimes come with words, without the ability to lable each and every moment, there comes a strange but beautiful moment of just being present with the other person. The community of Bonfim: in its latin character very welcoming, warm, careful.. It was visible that Padre Nuno and the people living at his house were very happy that we were there, which was also manifested through so many hugs and smiles. This open, welcoming, familiar and simple environment helped us to be spontaneous and ourselves, and it was essential to build our small community. We manage to create a balance between our space, physical or not, and the sharing time with the people of the parish. We lived in a small house next to Padre Nuno`s, but still separate from it. During the four weeks we helped in the morning with whatever the people in the secretariat asked us to do (wrapping statues in paper, taking pictures of icons ... ), we spent a few hours a day in a "daily centre" for old people and we worked in a project aiming at saving food from restaurants and re-distributing it to families in need. The work in the daily centre was not aiming at a practical result, which made it a very powerful and a real "servizio" (service); in fact, there weren’t any expectations from their side. I would say that from our side, we had some at the beginning, such as doing more activities together so that we could get to know them better; but we soon understood that it was, very simply, just about being there and sharing our time with a group of old people that sits on couches for a long part of its day. We had a wonderful nice prayer in the "centro de dia" with the old people! It was a moment of pure harmony and peace and they asked us to do it again! We are so grateful for this sharing! The food bank project was great and interesting in how it worked. The best part was the people, the group dynamics with such a broad mix of social backgrounds. They worked together in little teams, a different one each evening, each with their own system and their own personalities shining through. 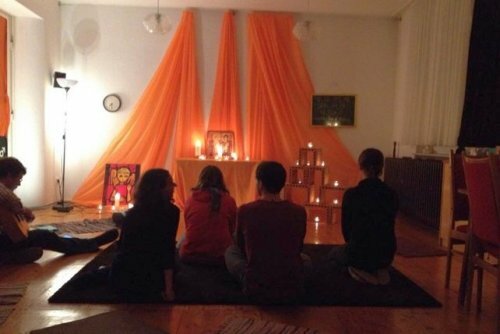 On Friday 29th, we organized an all night prayer, from 9pm to 9am. At this point there were many people coming and the chapel was full for many hours. we had a prayer every hour and the rest was silence ... never thought I would have said that, but it was great. The common life in Porto had with it some challenges, but I think that in any common life that is just part and parcel of what you are doing. It is inevitable that there are some days where it is a little more difficult, but then the beautiful and fun times outweigh every one of those days. A month seems to be a short time, not enough time for fighting and making up again, understanding that it is possible. My house and my parish are always open to welcome a provisional fraternity. I think that the evangelization of the cities will come through prayer and work, with the sole desire to serve Jesus. And if the community family ever live less by the gospel it is very good to "force" the existence of small communities living in the radical gospel effort. They do not replace the family, but go beyond the family. "When we see volunteers, that warms our heart. It is still hard for me to understand how people can give their time and their warm bed to be with us in the night and help." It is so touching to see how the refugees live together peacefully after going through such hard experiences. Their sharing of hope for a better time brings them together. In fact, it brings us all together. When they groan, we groan with them, in silence. When they pray, we pray with them, in silence. We also try to animate the common life among the volunteers. I spend a lot of time cooking. We try a bit to "serve the people who serve." Even though there is no room for us to hold prayers, we were able to invite four of our colleagues to a prayer in the camp, praying for the refugees on the road and for the volunteers. Sometimes our Muslim colleagues invite us to say the blessing over the food. We made an apple pie and we visited an elderly woman who can no longer take part in the prayers of the congregation. She was so happy to have someone to speak to, and we too. We sang together… For our evening prayers each one was invited and in this way we formed a very diverse group, people of the parish and friends of Taizé. Sometimes it was only us. At Gorbitz many people who had to flee their country live.The three girls sometimes go with some of them to the hospital, like a Syrian man who spoke neither German nor English. We live this whole time as a great blessing. Some things we had planned do not take place, but unexpected doors have opened. For now I can say that I still have the impression of being there - in the sense that somehow I try to continue living in a similar way - especially the prayers, and the inner need to meet with some people in a simple way and share life with them and help them as a volunteer. 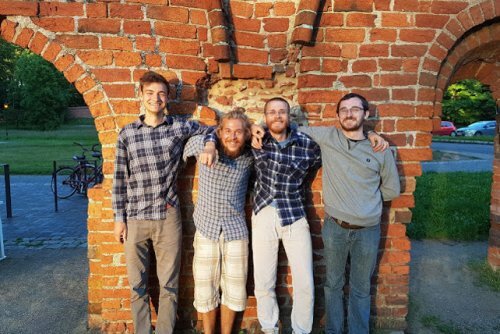 Three volunteers, Samuel (Netherlands), Adam (United Kingdom) and Petr (Czech Republic) spent a month in Hungary, hosted by the Jesuits of Budapest. They lived as a small provisional community in this country which has been marked in recent weeks by the passage of tens of thousands of refugees. 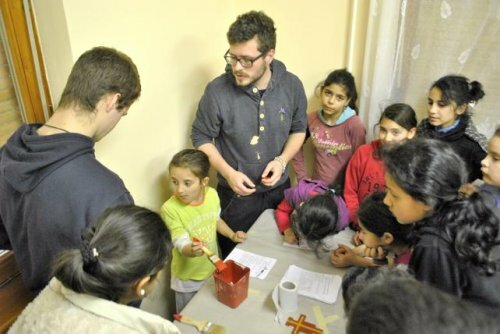 They helped with several projects run by the Jesuit Refugee Service, together with a female volunteer sent from Taizé, who stayed with a family. Their days were spent in Fót, at a refugee centre for children and young people under 18. They also took turns two by two to go to the border between Austria and Hungary and the Serbian-Croatian border where they helped to distributing food, hot tea, clothes and blankets. They took the night shifts to replace the volunteers on the spot who were very tired. “When we came in this morning we were warmly greeted by the boys we met yesterday. They were friendly and seemed happy to see us. We started the day off by thinking how we can make the place welcoming and feel ’homely’ for them... One of the kids drew a picture of me and showed it to me. The smile on his face and the openness was really important for me. Hello from El Xiprer! Merce lives in a reception centre. She’s the soul of the place. Upstairs live families. In the centre, there is also a food bank, a laundry, a professional kitchen, a large hall, offices, showers and, in the building next door, a chapel. Food is given out seven days a week and lunch is offered to around 50 people from deprived backgrounds. Breakfast is given to the homeless, who are primarily young Africans. Since 40 years, the community also meets twice a week for prayers and celebrations. Merce is a very friendly woman and her house is open for everyone. 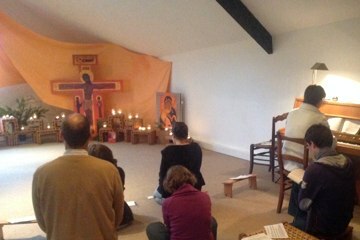 We have Taizé prayers in the chapel three times and day and everyone can take part. Merce, Tere and Xavi, who live in El Xiprer, come very often, together with the volunteers and people being helped by the centre. 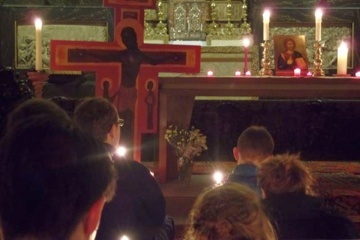 Twice a week, instead of the Taizé prayer, we join the prayer of the community. The Saturday evening celebrations are lively and profound. Every Sunday evening, we pray for half an hour in silence for peace – one of Brother Alois’ proposals for 2015. These times of prayer are important for us. They are a break in over very busy days and they help us think, reflect and pray for these people. Even though we’re not very good singers, we’ve managed to create a prayerful atmosphere. This is a miracle for us! Meeting people was the most important thing for us during this time. Many of them shared in a deep and sincere way about their lives and faith. Our time in Bellvitge as a small community is coming to an end. We have had many different experiences here, rich and intense. We were shown great hospitality and the people of the parish were very happy to meet us. We lived in Bellvitge, which is a neighbourhood of Catalonia’s second biggest city, Hospitalet de Llobregat, a 30 minute metro ride from the centre of Barcelona. Bellvitge only founded just over 50 years ago and the parish is even younger. It was built in 1993 and integrates in one building the church, a chapel, a small library, some small offices (for the priests and employees of the La Vinya foundation), a food bank, a kitchen, many meeting rooms and our flat. The prayer was a very important moment for our little community. Three times a day we prayed in a little, old church, which is called “la Ermita“, just 3 minutes walk from where we lived. Praying together united us with each other and also with the parish. We were almost never there at the Ermita without someone coming to join us for the prayer. Every day we worked in the parish: helping in the food bank, painting rooms and working with the children in the summer camp. We very much enjoyed meeting the people and sharing a part of their lives. Here people display solidarity very concretely, but also in a very discreet way. That mostly means working together and taking time to talk, to share daily news and joys. Solidarity does not mean giving someone lottery winnings or being very efficient in helping, but being present to others and just sharing simply with them. We left Bellvitge yesterday evening and had to say "Adios" (and Adeu!) to the people of the parish. We all feel richer for this experience. The month of May with the small provisional community in Hérouville Saint Clair has come to an end, and we are so happy to have had this wonderful experience! 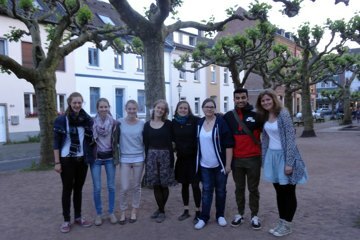 The 3 young people, Sarah, Jule and Caterina were very much appreciated everywhere for their authenticity, their attention, their availability. Many people came to the daily prayers and rediscovered the joy of a simple prayer - beautiful and accessible. It brought people together in a way that promises for the future. What was also nice was the way they took decisions together, though they did not know each other before. They joyfully opened themselves to so many people and experiences, even if sometimes they had to cycle at top speed to get from one place to another! From a craft workshop with people suffering from mental illness to going for walks with people with physical disabilities, playing games with lonely elderly people, meeting with children or secondary school students, the student chaplaincy, distributing food parcels ... the pace was often pretty upbeat! Saying goodbye at the end of the Sunday Eucharist in front of the whole congregation was quite emotional! First of all there was a huge gratitude to the Brothers of Taizé who had the idea for ​​these small communities and the fact that they actually came to fruition ... It’s been a great encouragement to put other beautiful ideas into practice, bringing that joy of communion and sharing! We are staying in a small flat in a lovely part of the city of Gerresheim. We pray in the morning in our flat and in the evening in the Catholic and Protestant churches (every second day). Usually between 20-30 people join us. We help in a home for elderly people with dementia: we play games, go for walks with them, help to feed them.... I think this place teaches us how our presence alone can be helpful – most of the patients usually don´t even speak German, they don´t recognize people around them, but they feel that someone is with them and is paying attention on them. And that matters. 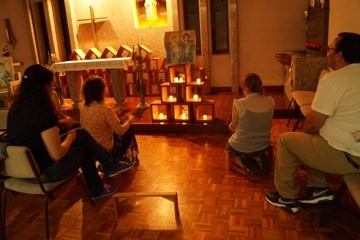 We sometimes pray in the afternoon with some of the guests in the small chapel in the home. Twice a week we go to the elementary school to play with the kids and to help them with their homework. We also go to the small kindergarten, mainly for refugees. We also take part in social projects dedicated to them, for instance an international café, where refugees from the area are invited to have a cup of coffee and a piece of cake and to spend some time together in a nice atmosphere. Last Saturday a bicycle workshop took place - those who couldn´t afford to fix their bike could bring it and get it fixed for free. Some social workers also found some bikes they offered to some people. Small initiatives like this take place a lot in this part of Düsseldorf, where many refugees live. It´s very beautiful to see! On Saturdays we visit the Coptic Orthodox church; we participate in the services and meet people, who welcome us like members of their family. In fact, this is how it looks – after the service, everyone gathers in one big room, each one brings something to eat and they share, talk, laugh.... Meetings for youth are organized there too. 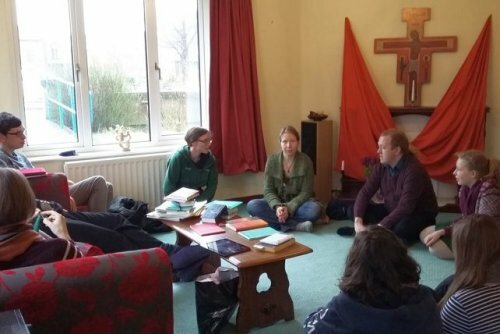 Last Sunday we had a prayer with Taizé songs and afterwards a meeting about life in Taizé. 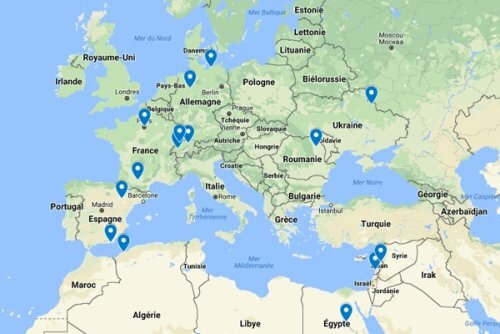 Some of them plan to go to Taizé this summer! The previous Sunday there was a workshop about cultural differences between Germany and Egypt. Our schedule is quite balanced. There are days full of work and events, but we also have time for ourselves to go for a walk, visit a city or just spend the evening together in our flat. We have a lot of invitations each week. People seem very happy to have us here, to meet and to pray... and so are we. Sometimes it seems we give so little and receive so much. We would like also to ask for prayer for all who welcome us here. We are already in the last week of our stay. In the first three weeks we took part in different social programs (distributing clothing and food, home for the elderly…). In addition we have three prayers a day; the midday and evening prayers are open to all. People come each day for lunch; they pray with us and bring something to eat. We took part in the Holy Week celebrations in Sélestat and we went to Strasbourg for the chrism Mass. We have received a very warm welcome and are happy to be part of the ecumenical community in this area. It was wonderful to see how many people are involved in social programs and parishes. In the many contacts we have made it is clear that solidarity begins by being together, and is rooted not in big projects but in brotherly love. Simply to share our daily life each day in a very simple way, without the pretension to change the world, is our way to live a new solidarity. 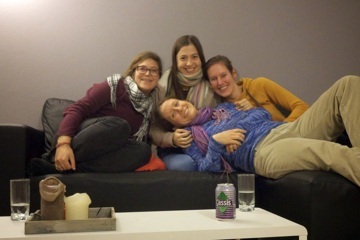 In February and March 2015, Franziska (Germany), Meghan (USA), Lena (Germany), Johanna (Germany) and Amandine (Belgium) lived as a temporary community in Aschaffenburg (Germany). 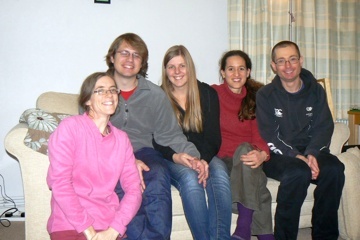 In January and early February we welcomed Jenny and Jurg, a young Swiss couple, into our community for five weeks. Together, for five weeks, the five of us formed one of these “small provisional communities”. It was a little different from the other communities, since we invited two new members into a community which already existed and would continue to exist after they had moved on. Together we discovered new ways of being community. By eating together, living together, talking together and laughing together we grew to know each other. These five weeks were very much a shared experience. Contrary to our initial expectation, and perhaps hope, that we would find others wanting to make the same long-term commitment as us, that hasn’t so far proved to be the case. What we have encountered, repeatedly, is people who want to share this life for short periods of time. It is a development which has, I will not deny, engendered certain challenges, both in the need to repeatedly re-establish relationships with new people, and in terms of not yet having found others with whom to share the longer term responsibilities for carrying the life and vision of the community. But if the challenges have been undeniable, there have also been immeasurable joys. They are not easy to list, these million little things we have shared. Living together through new discoveries, new experiences, new encounters. Being supported by others in a shared routine of prayer. Sharing different theological positions, but knowing you can still sit down and eat together as one family. We have learned that there are times when it is best not to try and hold to decisions too intransigently, or to try and tie up loose ends too neatly. At the same time, in the midst of regular change and renewal we have also learned the importance of, and need for constancy. It is, paradoxically, the experience of so much change that has reminded us to cling tightly to the core of our vision for what we hope this community might be. While much of our life may look different from what we imagined in the beginning, it feels right that the core values are not up for debate. For now then, I think I’m content to settle for this balance of provisionality and permanence which seems to have characterised the adventure so far. We have arrived in Rotterdam. The programme for us was too much at first as it was so full, but after discussing it we were able to modify it slightly. For the first week we were praying and eating in the Paradijskerk and didn’t have much opportunity to discover other realities. For future reference I think it’s a good idea to have prayers in different churches. The Paradijikerk and the Sisters of Love who are hosting us were wonderfully understanding and we are indebted to them for being so welcoming. Now we are finally into the rhythm of organizing our prayers three times a day together and the jobs we have to do beforehand - such as opening the church, lighting the candles and ringing the bells. The latter job is the one we enjoy the most. Two bells at once by hand is a little challenging but we are getting better. Less like warning bells and more like gentle church peals! We really enjoy seeing more and more people being to come to our prayers. The young people here who had faithfully been continuing prayers here since the European meeting four years ago have really taken us under their wing, and its lovely to see some familiar faces. Every Friday the young people of the parish organize a prayer, and this evening we will have the Catholic bishop coming to pray with us. We are also very involved in the various projects around the city. So far we have spent time helping the Sisters of Mother Theresa feeding the homeless. We attended part of the bishops ‘Tour of Faith’ meeting the young people of the parishes, we volunteered in the Pauluskerk, and many events organized by the Paradijikerk. 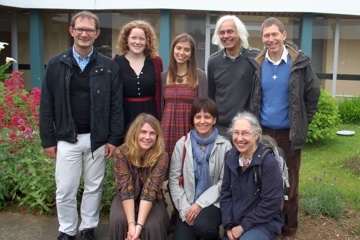 Our small provisional community was hosted in Montferrier-sur-Lez and Montpellier. We stayed at a Catholic high school. In the morning, we meet people welcomed at the "Solidarity Stop" in Montpellier, who live on the streets or are inadequately housed. A different reality opened up for us when we spoke with those people, and especially when we listened to them. Their life is often hard, but they need to talk, to be listened to. We also welcomed them to our prayers. 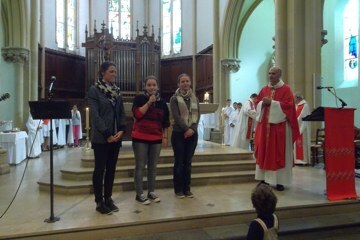 In addition, we wereregularly invited to chaplaincies and youth groups throughout the diocese of Montpellier. With them we had some very interesting discussions, including issues related to vocation, the characteristics of different faiths, since our small community was ecumenical. We had the chance to participate in Masses and prayers with a great many religious groups: the Sisters of Bethlehem in their monastery at Mougères, the Dominican friars, the priest in charge of those welcomed at the Stop, two Protestant parishes, several Catholic parishes, the bishops and their team at the diocesan house.... In addition, we were invited in a mosque. This trip allowed us to verify that living together, praying, sharing meals and feelings between people of different backgrounds, cultures and languages ​​is quite possible. We are very grateful to all those who made this experience possible and so enjoyable. It’s hard to believe that five weeks have already passed and we are already back home. And it’s also hard to find the words to describe our experience; we can never thank our parish of Chatillon and the Taizé Community enough for allowing us to live this experience that changed our lives. Nothing could be taken for granted; the beginning was not easy. It takes time to get together when you come from four different countries with different cultures, from many different backgrounds.... But in the end, our efforts bore fruit: we came as strangers for each other, but we left as friends and even as sisters. The days were very varied, sometimes we took part in the activities of the parish, sometimes we went to Paris or somewhere in the diocese to see how Christians live there. We also discovered the importance of prayer for living together. Taking time together to offer to God what we experienced really helped us in our daily lives. The clock is ticking, time is passing, it’s been a month since we got here. Our adventure is coming to a close, it’s time to leave, to say our farewells and goodbyes, our best wishes...our hearts full of happiness and our luggage full of memories. It’s time to get on with our lives, the pause is over, curtain time! Now we must return to our daily lives, our habits, our traditions, go back to our families, our country [...] but the difference is that we have grown, we have matured and we have changed! Yes, today we can say we have succeeded in creating a small community, we are fully aware of the provisional side of things but we are proud to have tried and succeeded. This is certainly one of the best experiences that will ever be given to us to have: trying to build something so powerful, so intense, so appealing and so alive! We are indebted to all the people who welcomed us here, near or far, at work or at church. To all these people, through whom this life experience will remain forever etched in our memories, we say: THANK YOU! Every morning we pray in the house, and it’s nice to start every day with singing and silence. Although it is sometimes difficult to get up early, we are all motivated to pray, and we appreciate the morning prayer. After we have breakfast together and then we go for activities. Two of us go twice a week to help at a "social market" where people without much money can buy food for a low price; the third has been spending time at a second-hand clothes shop. In these places we serve the customers, we drink coffee and we spend the morning with the other people who work there. On Tuesday, we visited a monastery where most of the sisters are quite old. We spent some time with them and helped them a little. 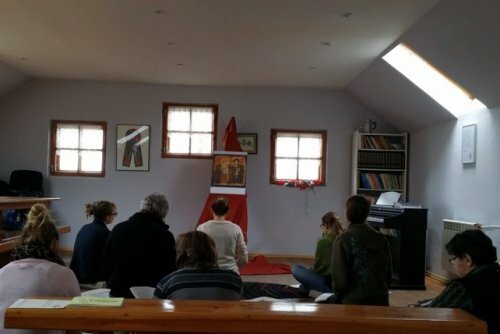 Almost every day, we have the midday prayer in the church of a convent in Amstetten, where Franciscan nuns pray, sometimes joined by some classes of the convent school. We also take lunch in the school cafeteria, where we meet the teachers. In the afternoon we have other activities, such as visiting elderly people at a club organised by the Red Cross on Monday, a club for teenagers with learning difficulties on Thursday and a children’s club on Friday. Every night we pray, most of the time in the church next to our house, and often a few people from the local community come to join us for prayer. Sometimes we join a prayer with songs from Taizé elsewhere, or we organize a prayer somewhere else. Our days were structured around three prayers a day and service at the local branch of Caritas, serving food to people with low incomes and meeting them, doing dishes, cleaning up, packing food, doing odd jobs etc. We also had a great number of meetings: with youth groups, in schools, in various churches, and with the bishop of Mantova. In this way we could give a witness about our community life, our motivation, our faith. Some meetings were very challenging, as the teenagers asked questions which made us think deeper about our own faith. Many were agnostics and skeptical towards the church but we met them with honesty and I experienced that somehow we were able to find good words for very different situations. We invited everybody to our prayers. Sometimes we prayed alone, sometimes with many people. There was also a small group who came regularly to our prayers. During our stay we were hosted by the parish of Suzzara, and I must say that all the people, priests, volunteers, and the ladies who run the kitchen there were extremely welcoming and kind to us. This was a wonderful experience for both sides, I think. It is strange: we came with empty hands, and yet we could give and receive so much. We felt like we were part of a family. We cannot believe that the first two weeks of our stay here are already over. We are really enjoying our time here in Bragança. We have met many very nice people here. We also enjoy our work. We work in a institution that includes many different kinds of social work. Most of the time we are working with elderly people that live in poverty. We sing with them, bring them to church, play with them and try to talk with them. We don’t all speak Portuguese so at the beginning it was a bit difficult to communicate with them but now we have learned that communication works with a mix of different languages and smiling. Twice a week we also work with children from poor families. We like to be with the people , every day we get to know them better and are more familiar with them and we love to spend time with them. Some people come to join us for every one of our prayer times. We experienced many beautiful moments, even through situations which could be depressing as you are confronted with the suffering of others and your own weaknesses. But the joy was still there, with moments of silence and gratitude. We are on the border of three countries and again we realized how important it is to find a common language and listen to each other. Common prayer has brought us together, has relieved us and given us a new impetus. At Jean Arnold Home, we are all grateful for having had the small provisional community with us. Our journey to Taizé on the 13 September was a wonderful moment. We were 47 people who made the trip to collect the 3 young women who would form the small provisional community that we are welcoming in Roanne. We enjoyed very much taking part in the bible introduction and the small sharing groups. People are still thanking me as I meet them in the street. 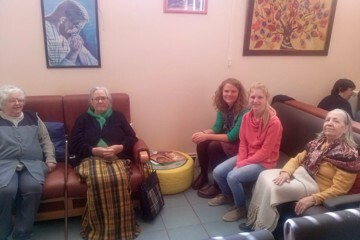 Marlene, Michelle and Katja are nicely settled into their little flat at St. Anne’s parish. They’re able to get about by bike, hopping between Secours Catholique (humanitarian organisation), the protestant church, the Notre Dame drop in centre ... When they have to go further people offer them lifts. People are genuinely touched to see these young women who give their time freely in order to go and meet others. The prayer times are beautiful and the number of people is growing all the time. This visit really promises to help bring people together and get to know people from across our region! What has struck me most during the last few days spent in Kiev is the joy that seeing us gives people. 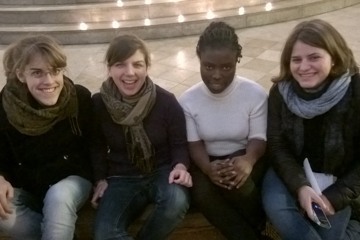 We’re just a little group from Taizé, coming to Ukraine keen to meet them and try and help with something. I think it’s very important for them to see that there are people who are willing to come and meet them after recent events. One think I like here, in Kiev, are the Orthodox liturgies, full of song. Up until now there has always been a choir singing admirably in at least two voices. In the larger celebrations, for example on Sunday at the Lavra monastery, there was a choir which gave the Liturgy the beauty of a concert. The visit to the Poverello of the small provisional community is going very well, both for Bram, Benjamin, Mark and Paul and for us, the family of the Poverello, that is to say, the volunteers and guests who come for a meal or stay for a while with us. Every day, more than 700 meals are prepared and served in various centers of the Poverello in Brussels; it is also possible to give accommodations to 55 people. For those who arrive at the Poverello, beyond material and practical issues, there is above all the need to find rest, to achieve a balance and to meet others. 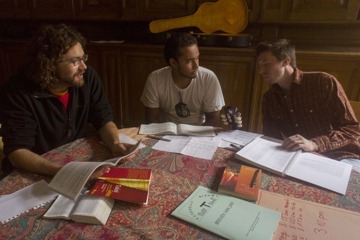 The small provisional community staying with us is really organized to have their prayer three times a day. 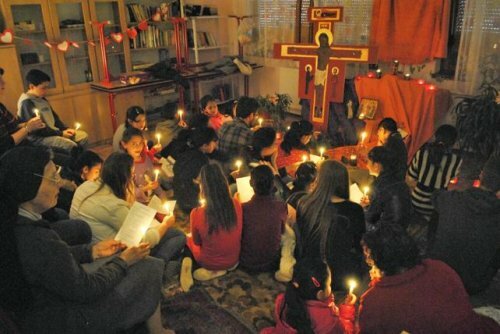 At these times of prayer in the chapel of our home, the volunteers and sometimes the guests at the Poverello take part. We see that they are very commited to their work and are interested in what is happening at the Poverello. For all of us their presence and prayer is really a support and an encouragement! “It’s hard to believe that more than half our stay in Porto is already over. We have been blessed to meet people aged from 2 to 87 years who seem to be genuinely happy we’re here, even though really it is our privilege to see the world through their eyes for a while. There seems to be a great appreciation for three people leaving their everyday lives behind to get to know this parish and neighborhood, living and praying in an alternative way, interacting where legions of tourists only walk past, and discovering how much those who may be disadvantaged materially have to give and to share. Although the language barrier is something of a challenge, the language of love and service and dedication seems to be appreciated beyond all grammatical errors or instances of Portunhol. We are fortunate to be involved in all aspects of the work of the parish’s social center: we accompany toddlers to the playground and make sure they do not forget to keep their little hats on in all the fun and excitement. We support the work with the homeless, one of whom has turned out to be quite a guitar aficionado, making him appreciate Taizé songs even more. We do gymnastics with the elderly and take lovely old ladies who have trouble walking to have some coffee or visit relatives.